GET MORE EPISODES! SUBSCRIBE TO THE PODCAST! JOIN THE MAILING LIST! STAY UP TO DATE & GET SECRET SHOWS! Well, that was a fun week. Thanks to all of you for making the re-launch even better than expected! Obviously we have a lot of kinks to work out, but as long as the microphones and internet keep working, we’ll just keep riding! I guess I’ll save most of my talking for the show, since we’re on every day now. We’re gonna try to have someone new on each show this week. Then once we get into a groove again, we’ll start making it even more fun! The BARMY should be up and running tomorrow morning! We were gonna launch today, but we had a couple hold ups over the weekend that we weren’t expecting. Make sure to look out for our updates! If you haven’t been watching our show live, try to check it out this week! 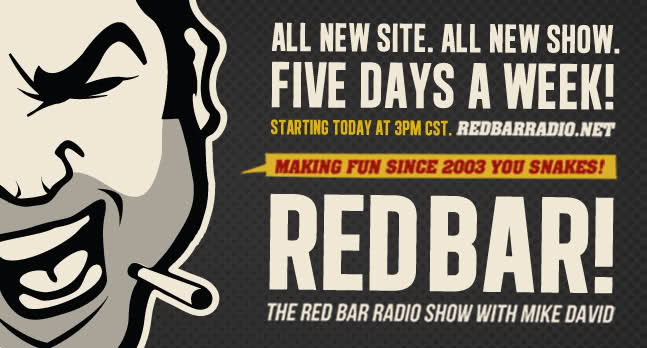 We’re on LIVE every day at 3pm cst, over at https://redbarradio.tv . We’re going to be doing some amazing things with the video format, so you’re definitely missing out if you’re only listening to the audio version of the show. The video shows are all recorded, and uploaded to the BARMY the very same day! So once the BARMY launches, you will be able to catch up on all the video shows! Also, I’m sure a lot of you have seen our video highlight clis that come out after each show. Please SHARE these on your Facebook’s and Twitters! If we can all get in the habbit of sharing the videos every day, eventually millions of people will be aware of Red Bar, and hopefully a few of them will become fans! Check out all of the video highlight clips we have so far by visiting our YOUTUBE CHANNEL. Oh – have you checked out our Amazon Wishlist? We’ve had the wishlist up for about a month now, and many of you have purchased things off of it to help the show get back up and running. When you purchase something from the gift lift, you get back double the value in Barmy, and some of the items even give you autographed memorabilia from the old studio! Check out this wishlist, as it’s only gonna be up for a week or two longer! CLICK HERE FOR THE WISHLIST! TODAY ON RED BAR: Just Mike and YOU again! Mike will take your calls about ANYTHING! Stories, news/current events, advice, relationship questions, questions for the show, ANYTHING! Start thinking now! Our number is 773-800-2980 – Too shy to call in? Send your question via email to [email protected] – about 2 hours till show time! IN THE TOP 20 ON iTUNES! Thanks to you guys downloading the show, RBR has launched to #16 on the iTunes charts today! Muah! Awesome!